Last week, I promised there'd be more laughs - and as Morris Minor & The Major catapulted up the top 50 this week in 1988, the highest new entry came from one of Australia's biggest comedy acts. In recent years, it's only really The Lonely Island who've managed to crack the singles and albums charts (unless you consider LMFAO to be a comedy act) and you're more likely to find comedians in the DVD section of JB Hi-Fi. But, back in the '80s, artists like George Smilovici, The Twelfth Man, Kylie Mole, The D-Generation and Jacko all achieved chart success. At the top of the singles chart this week in 1988, Kylie Minogue made it two from two with "I Should Be So Lucky" dethroning Bill Medley and Jennifer Warnes from the number 1 spot. She'd stay on top for six weeks. Written about the tumult in her professional and personal lives over the previous few years, this title track from Sharon O'Neill's comeback album didn't follow "Physical Favours" into the top 50. The first BCO single to miss the top 50 probably should've led with its superior B-side, "Bombshell", which also received promotion at the time and was effectively a double A-side. Returning with his first non-soundtrack solo album, Dave Dobbyn couldn't match his NZ success with this lead single. Keep an eye out for Margaret Urlich bopping along in the video - it's hard to miss her in that bright green skirt. Single number four from James's top 5 self-titled debut album didn't even get a proper video - a live performance was played on the music TV shows - so it was no surprise when the single didn't make the top 50. I actually liked "Heaven On A Stick" more than "Fall Of Rome" or "Rip It Up", but then I was never an Australian Crawl fan and only had a passing interest in James, so who was I to judge? I was a fan of the previous single by Perth band The Manikins, "What Are You On", but this track, which was released back in late 1987, was the closest they came to the top 50, slowly climbing to its peak over a period of months. Another decent sized hit for JCM with the third single from The Lonesome Jubilee. More "Cherry Bomb" in style than "Paper In Fire", it was the last top 50 hit from the album - a fourth track would just fall short. It took more than 20 years - and the death of the King Of Pop himself - for "Man In The Mirror" to become the hit it deserved in Australia. When it was released in 1988 as the fourth single from Bad, it was a chart disappointment in Australia, although it did give him another US number 1 single. The lack of a big budget music video and the fact that most Australian fans had bought Bad already didn't help matters. 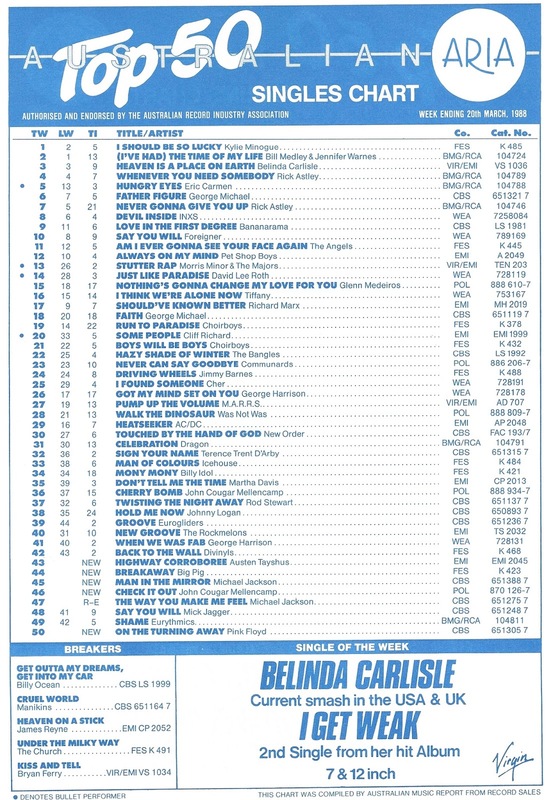 Then, in mid-2009, the song was one of four tracks by Michael to surge into the ARIA top 10 after his death, and reached a new high of number 8. 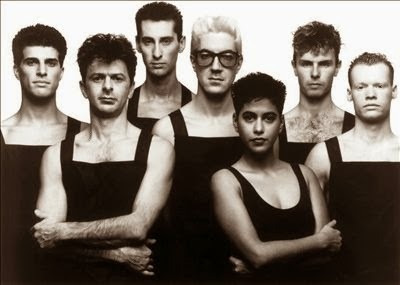 A song that got to number 8 in 1988 was this third single from the distinctive seven-piece Australian band who'd previously reached number 18 with debut single "Hungry Town". 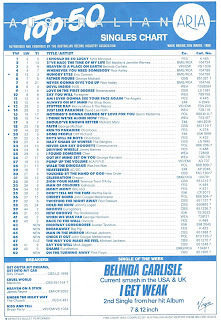 Sounding like nothing else on the chart, "Breakaway" would be the biggest hit from the amusingly titled album, Bonk, and, after popping up on the soundtrack to Bill & Ted's Excellent Adventure, reached number 60 in the US. What I never realised until now is that "Breakaway" started life in 1973 as "I Can't Break Away" by Chuck Jackson. Another fun fact: lead singer Sherine Abeyratne is the twin sister of Zan of I'm Talking fame. Next week: the arrival of a future number 1 hit and another Australian classic that was not as big as you might expect. Man in the Mirror was one of the best MJ songs in my opinion, and considering the quality and breadth of his collection, that's saying something. I also could never understand why it didn't chart well in Aust - it deserved a lot more, but has since gone on to prove its longevity and prominent place in any MJ collection. Ballads didn't always work in Australia - and MITM also suffered by being fourth single and, given the small population at the time, there just weren't enough MJ fans who didn't already own the song. Didn't know the Sharon O'Neill track until getting the VHS I ripped it from. A nice song. 'Heaven On a Stick' received a LOT of airplay on Melbourne radio station Fox FM. I was quite surprised when I learnt that it missed the top 50. Hadn't heard the Manikins song before. Interesting. A bit like Kate Bush in the higher note parts. I liked 'On the Turning Away'. Surprising it didn't chart higher, though I guess they were more of an albums act. 'Breakaway' definitely had a unique sound, and I was a bit surprised by its chart success because of it. I too didn't realise it was a cover until a few years ago. Never heard 'Highway Corroboree' before. Some... interesting stuff in there.